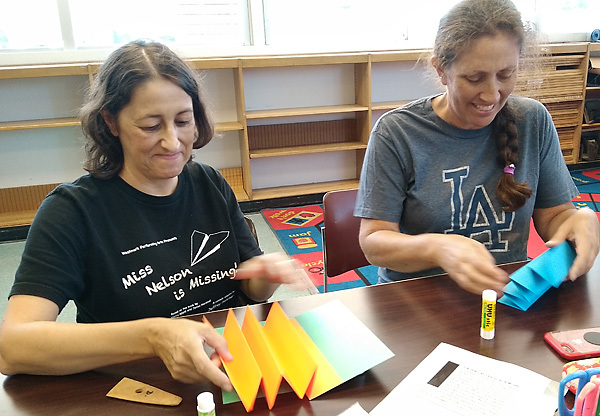 In our recent program at the Granada Hills Branch Library of the LAPL, 23 participants created “folded fan” books, comprised of an accordion spine, front and back covers, and fan pages. 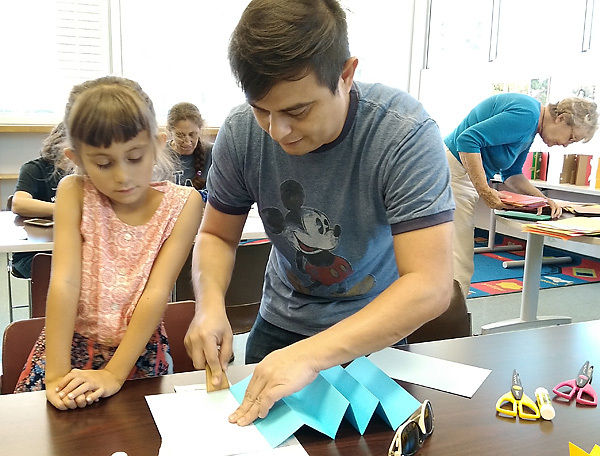 In honor of National Hispanic Heritage Month, they added their own “Picado Papel“, decoratively cut and punched papers, which added a special touch to their creations. 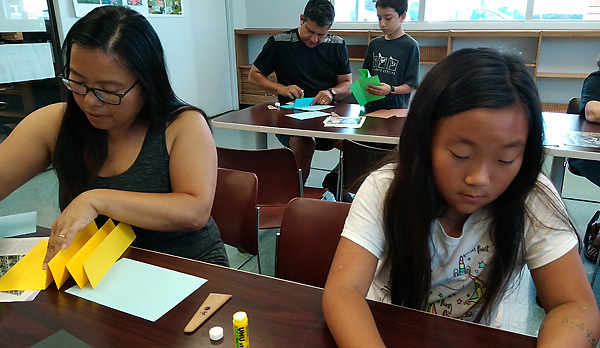 Families turned out, and parents worked closely with children to achieve their artistic visions! 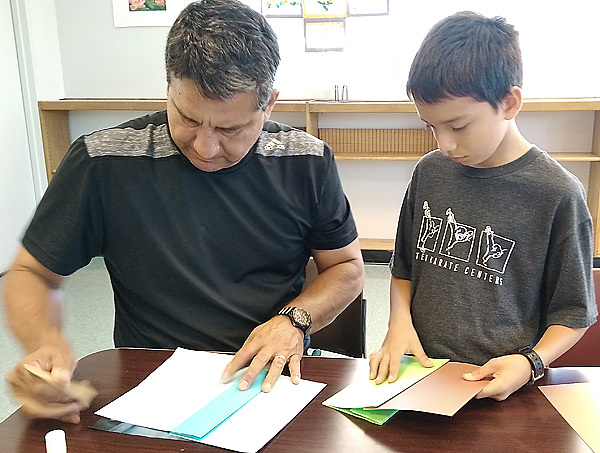 Especially heartwarming was the number of Dads who devoted themselves to supporting their sons and daughters through the process, while creating beautiful works themselves. And let’s not forget the Moms! It is wonderful to see adults give themselves over to the creative process. Parents, and all people, so need this time. 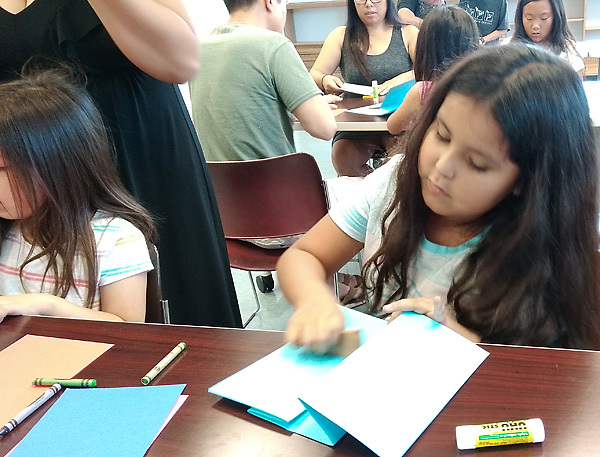 This workshop was part of my artist residency project: “We Write the Book“, supported by the Department of Cultural Affairs of the City of Los Angeles. Gratitudes! 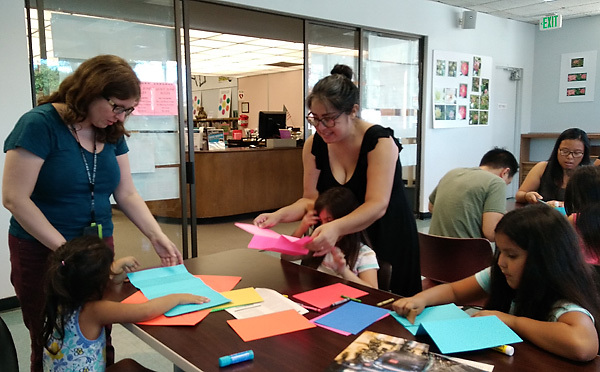 Children’s Librarian extraordinaire, Alice Schock, engages with a young patron, artist and participant. 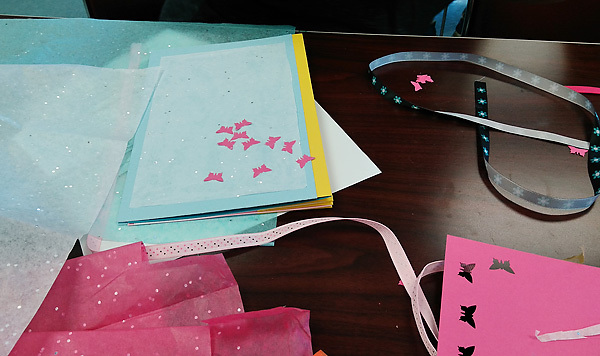 The work of our hands…and creative ways of using shaped hole punchers to create Picado Papel! Sisters and friends work together. This young teen, age 13, took off with a Halloween theme. 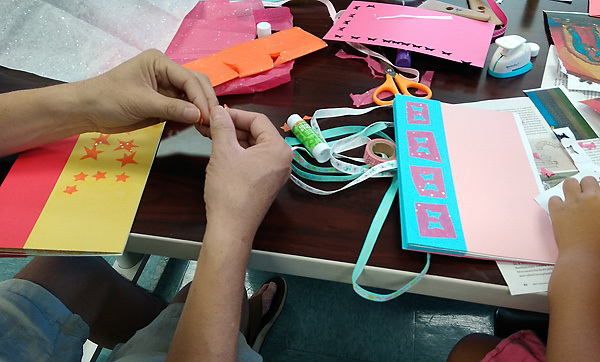 Through careful work, discerning choices, and elegant handicraft, she designed a book that we hope she will keep forever! 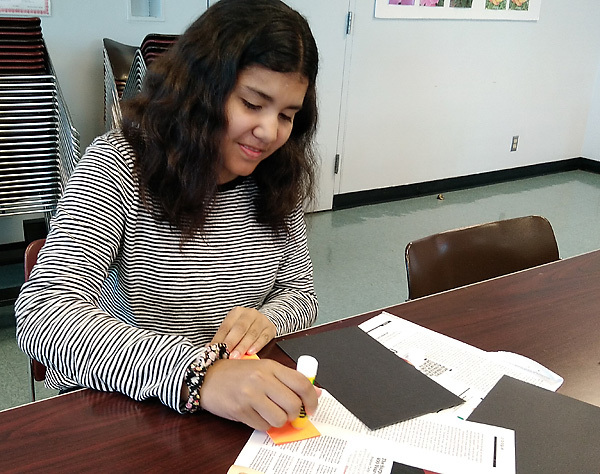 This young maker transformed images of a noted Los Angeles mural of the Virgin of Guadalupe, and used the beautiful colors as a surface to create a repeated design with a butterfly-shaped hole puncher. 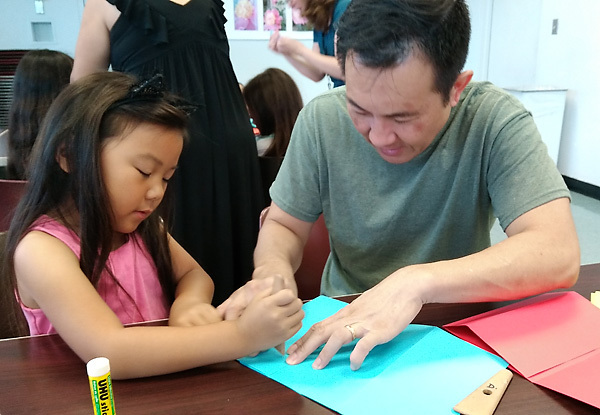 Piper and her Dad attended an earlier workshop, and were back again creating happily together. 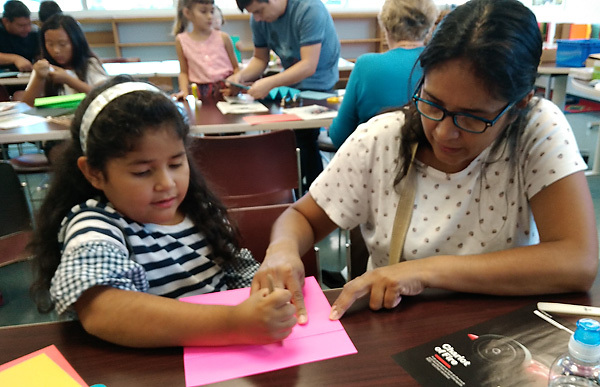 Father and daughter work closely on her book. 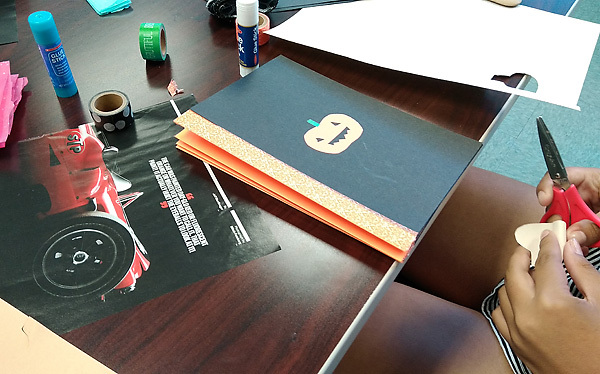 her Mom said that though she herself loves scrapbooking, she could never get Dad to do it. 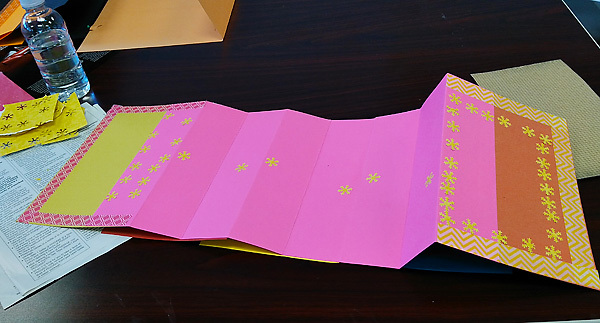 Now, maybe he might, after seeing how much fun cutting, pasting and arranging are! Here is Mom at work on her own masterpiece, along with older daughter. Sebastian and his Dad work side by side. spending precious time together. Yellow blossoms drift across a luminous pink ground, floating in a world of warm colors. Washi tape is used to good effect as a framing device on the covers. Benny and Mom have fun. Who says one has to sit on chairs? These two friends had a blast, and worked with very different color schemes in their projects. This is Greer’s second workshop. 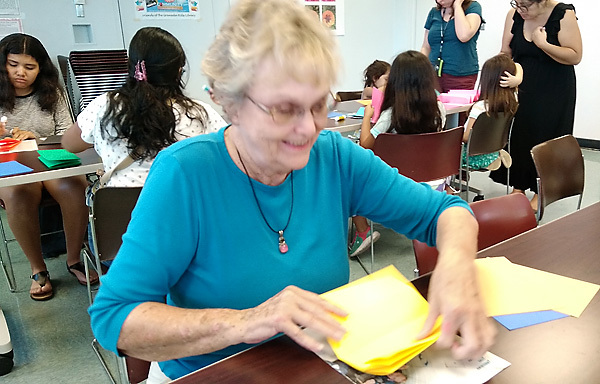 She loves to work with her hands, and even contributed some extra Washi tape to the cause! 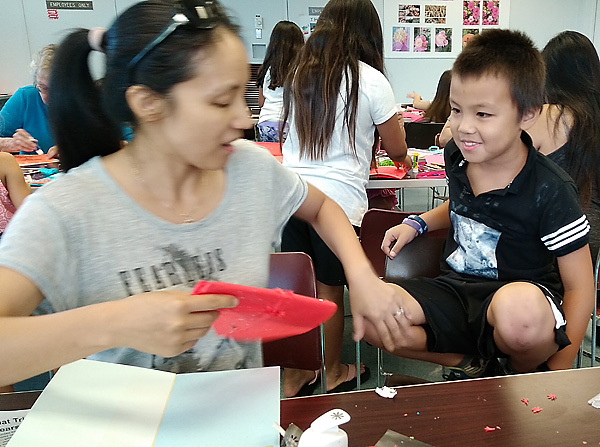 Our scrapbooking Mom works on a mini-masterpiece. 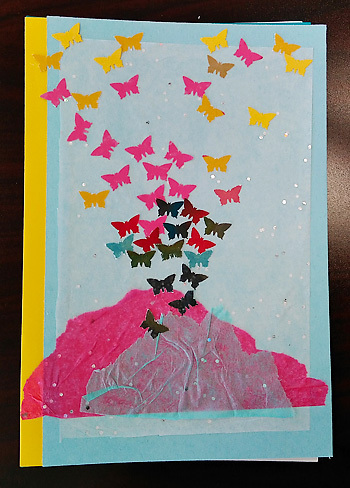 What patience it takes to punch out all those butterflies, then arrange and glue them to the cover! But how worth is it was…here is her magnum opus…a treat for the eyes, heart and soul.